We all know how hard it is to kick a bad habit to the curb. Just try giving up tobacco, or alcohol, or sugar for one week and see how you feel by day two. Habits are sometimes about the physical effects (i.e., smoking, drinking, etc. ), but they are always about the mental reward of engaging in the act. So, quitting bad money habits can be just as difficult as giving up a food or drink you can’t go a day without. It’s not impossible, though, and we’re going to show you the easiest way to shift your money habits to get out of debt. Psychologist and author of “Making Habits, Breaking Habits”, Jeremy Dean, says that habits are difficult to break because most of our behavior is automatic. In an article on Forbes, he says that one of the key steps to breaking a habit is to “replace the bad habit with a good habit.” So, rather than quitting your bad spending habits cold turkey, we’re going to show you how to shift your bad money habits and replace them with better alternatives. Impulse buying is making a purchase without any prior planning. We’ve all done it. The danger of impulse buying seems to be only when we make “big” purchases – new car, TV, etc.. However, while big, expensive items can be really dangerous to your finances, so can impulsively buying lots of smaller dollar items. How to Shift It: Plan ahead. The way to combat impulse purchases is by planning ahead. When you make a plan for how to spend your money, it’s a lot easier to not spend it unexpectedly or impulsively. 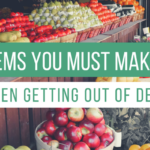 You should make a list before going to the grocery store, create a plan for how you’ll spend your money each month (this is called a budget), and decide what purchases are OK to make and which ones are not. Also, for the holidays or for birthdays, make a plan for who you’ll be giving gifts and how much you’ll spend on each. When you plan ahead, it’s much more difficult to fall into the habit of impulse buying. Another way to curb impulse buying is by staying clear of the places that cause you to buy things impulsively (i.e., the dollar bins, the sales section of your favorite store, etc.). If there’s a store that you can’t seem to go into without buying something, don’t go in there while you’re working on breaking this habit. How to Shift It: Create & use a budget. Shifting this bad money habit is pretty simple: start using a budget. Contrary to popular belief, a budget doesn’t have to restrict your spending. Instead, a budget can actually give you the peace of mind to spend without guilt or regret. A budget is a plan for how you’ll spend your money. Using one will help keep you from overspending and falling further into debt. If you’ve tried using a budget before, but had a hard time making it a habit, check out our blog post 4 Ways to Make Using a Budget a Habit. If you’re just getting started and creating a budget feels overwhelming and difficult, it doesn’t have to be. There are dozens of online budgeting tools that make creating and using a budget easy. To get started, check out our list of the best online budgeting tools to get out of debt. How to Shift It: Set aside 1 hour a week to plan and shop. We all know how expensive eating out can be, especially when you do it often. So, why do we do it? It’s all about time. We’re busy. We barely have time to make it to the grocery store, let alone to cook a meal every night. However, with a little extra planning and a little more time, you can save a ton of money by eating out less and cooking at home more. Set aside 1 hour every week to plan your meals and grocery shop. That’s all you need. Search for recipes online that are easy and fast to make. Cooking at home doesn’t have to mean gourmet meals every night. By putting an extra hour into planning and grocery shopping every week, you’ll drastically reduce how much and how often you’re eating out. How to Shift It: Find accountability. 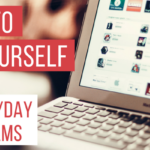 No matter how much planning you do, it can be easy to procrastinate, and procrastinating with your money can lead to all sorts of financial troubles. To kick this bad habit to the curb, you need accountability. If your finances are combined with a significant other or a spouse, make a plan to hold each other accountable. Help keep each other on track, and schedule regular money check-ins. If your finances are separate, ask a close friend or family member that you trust to help hold you accountable, instead. Share your goals with them, talk about your budgeting plans, and ask them to check in with you regularly. Knowing that someone else is aware of your money goals is an amazing way to hold yourself accountable for reaching them. You can also hold yourself accountable and keep yourself on track by setting goals for yourself. For example, set a goal to treat yourself when you’ve paid off a certain amount of debt or reached one of your goals. Knowing that you’re working towards a bigger goal and rewarding yourself along the way is a great way to hold yourself accountable. How to Shift It: Automate your savings. If you want to make saving easy, automate it. Most people don’t save because by the end of the month, there’s no money left over to save. If you sign up for a program that automatically saves money for you, though, like Digit, you won’t even have to think about. If automating your savings sounds great, but you want to save $1,000 fast to build an emergency fund, we shared some of our top tips in this post. Many people end up going into debt to cover unexpected financial emergencies. So, having money in an emergency fund to cover those unexpected expenses will help you stay out of debt and prevent you from going further into debt. How to Shift It: Use a budget, and plan ahead. Living below your means begins by knowing what your means actually are! Not only should you know how much you earn each month, but also how much you’re already spending every month. Then, you can create a plan for how to live within, or below, your means every month without spending more than you earn. If you want to be intentional about how you’re spending your money and you want to stop overspending, create and use a budget. Continuing to spend more than you earn is only going to leave you with more debt. So, if you find yourself pulling out your credit card, or taking out payday loans, to cover expenses every month, try using a budget and start planning ahead. 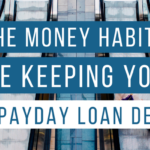 Bad money habits could be the reason you’re stuck in a cycle of payday loan debt. So, getting out of, and staying out of, debt requires shifting those habits that have become second-nature. Shifting your bad money habits to get out of debt takes time, though. So, start with one habit and work on it. Shifting even just one financially destructive habit, though, can result in huge financial gains. 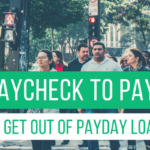 If you’re dealing with payday loan debt, try payday loan consolidation paired with breaking your bad money habits to get out of debt even faster. Call our team today to find out more about how we can help with payday loan consolidation.